While the game of golf is popular among a wide demographic, it’s especially prevalent in the senior community. Those over the age of 50 make up a huge part of golf culture. Senior golfers are known to spend hours on the green as part of a country club. Golf requires great skill and patience. Despite its rather serene and tranquil nature, golf also has a lot of physical demands. Everything from a long drive to a controlled putt requires precise body positioning, muscle movement, and agility. Unfortunately, playing golf can prove to be a challenge to seniors. With age comes great challenges. The body undergoes changes that can hinder basic movement. Because of this, senior golfers tend to experience a decrease in skill and ability. Note :Staying focused remains one of the most important keys to success in a game of golf. Stephen Ladd and Bill Gladwell have written and recorded everything there is to know about improving the mental game for seniors. They’ve put together a system called Renegade Mental Golf that helps seniors with any mental roadblocks they might have. Click Here! for more information. Luckily, a changing body doesn’t mean that golfers have to give up their favorite game. There are a number of methods to overcome the challenges that come with aging. Specially designed clubs are one of the easiest ways to compensate for a loss of power, flexibility, and precision. With the right clubs, a senior golfer can play like they did when they were younger. A variety of options is available, allowing seniors to find something that will work with their specific needs. Here are 7 of the best-rated golf clubs for seniors. The Speedline Plus set from Adams Golf is perfect for seniors because the collection of clubs are designed to get maximum speed and distance. It’s considered a hybrid set because it contains the best of wood and iron. You’ll be able to get more distance at lower power. Drivers are designed to reduce drag during a swing. This feature coupled with a large sweet spot and perimeter weighting make it easy for anyone to be successful. The set includes a 12A 3 driver, 16A 5 wood, and a 20A 5 hybrid club. These are all contained in a stylish red putting bag. This set is carefully designed to be comfortable and efficient. Seniors will benefit from the increased grips. The larger grip diameter allows players to get a comfortable hold of the clubs as they swing. The shafts are very flexible and made from graphite. This material also attributes to a light weight. High lofts are also used to improve distance. Special design elements, such as a deep cavity on the iron, are implemented to increase accuracy. All in all, this set from Wilson is made to accommodate the physical needs of a senior player. 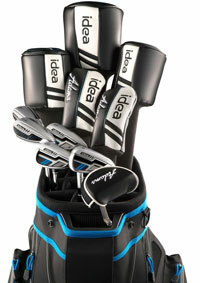 It includes a fairway wood, driver, hybrid, putter, and 5-SW.
Hybrids are a great alternative to irons. They provide a number of great benefits to those who are experiencing difficulties with standard irons. 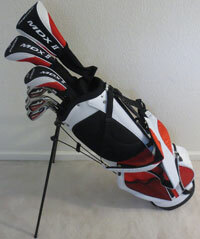 This set from Majek is comprised of all hybrid irons. The irons are carefully designed with UCLA’s engineering department to be more forgiving and successful. Accuracy is improved thanks to the positioned weight and cavity of the heads. A larger sweet spot covers imperfections in accuracy while a higher loft angle allows the ball to fly much farther. A successful hit can be made even if the swing, power, and coordination weren’t perfect. Containing a driver, 3 wood, 5 wood, 4 hybrid, and 5 SW irons, the set includes everything a golfer needs to play successfully. This includes strategic design to overcome common issues. The clubs have a very flexible shaft that is perfect for senior players. A loft angle of 10.5 also improves distance while the large and thin club face provides a more forgiving sweet spot. Fairway woods and hybrids also have weighted pads distribute weight differently. They take it away from the face and position it more towards the back of the head. This improves accuracy and lets the ball soar. From Tour Edge comes this HP 25 complete set. The set is impressive in terms of both appearance and performance. In its entirety, the set is incredibly lightweight. The putter bag is easy to maneuver. Individually, the clubs are light and designed for success. The stainless steel heads have a cavity and large face. This cavity provides maximum forgiveness, allowing golfers to hit the ball successfully despite contact being off center. Headcovers and a handy bag will keep the entire set protected. 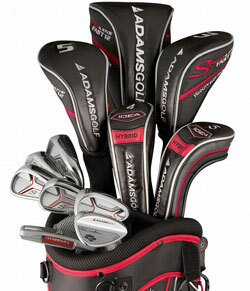 The Idea set from Adams Manufacturing is perfect for senior golfers wanting to get the most out of their swing. Shafts are made from graphite. It’s strong, yet flexible enough for more speed. Cut-Thru sole slot designs also improve speed. Additionally, it increases the launch angle. The sweet spot of the club heads is also increased and tested to provide a 43 percent increase in speed for off-center shots. Even those that are hit in the perfect spot will experience a 23 percent increase in speed. This complete set from Senior Tour Golf has everything a golfer needs. It’s uniquely designed to cater to older golfers that may need to compensate for a loss in power, speed, and accuracy. Graphite shafts have Senior Flex, which improves speed and distance. All of the clubheads, from the woods to the hybrids, have oversized faces. This dramatically increases the sweet spot. Gone are the days of less-than-powerful shots and inaccurate aiming. Faces are perfectly aligned and balanced to create a more successful and enjoyable playing experience. The biggest benefit of using these clubs is the ability to achieve the same results as when they were younger. In many cases, improving the condition of the body is not possible. With the right club, senior golfers can still enjoy their game and compete against those without physical limitations. Essentially, clubs compensate for common handicaps that seniors face. One of the biggest changes is a loss of muscle tone, resulting in a decrease in power. Seniors may notice that their swing begins to dip below 60 miles per hour, which leads to less distance. Another common problem is flexibility in the hips and shoulders. Joint problems will arise, which causes problems during the back swing. During a swing, the body needs to turn to get maximum power. A lack of flexibility hinders this movement. Agility and coordination are also affected. While golf may look pretty easy to an outsider, it calls for precise body positioning and placement on the fly. To make a successful drive, golfers must perform a series of movements to get the best results. A loss in agility and coordination throw this muscle memory off and affect the shot. Simple changes in the traditional club design can make a huge difference. Before choosing a specific club, there are a number of things to consider. Senior golfers should take a look at their body and playing style. By taking notice of changes in ability, golfers can pinpoint where their problems lie. From there, finding the right club is a breeze. The shaft plays a big role in swing performance. It’s a good idea to look for a lighter shaft that weighs no more than 60 grams. Senior golfers can benefit from a lighter option because it’s easier to handle and can improve speed. A shaft with a weight around 50-55 grams with affect swing speed and timing. In addition to weight, senior golfers should look at the design of the shaft. Weight distribution and length are small changes that can make a big difference. More weight towards the grip end of the shaft improves accuracy while an extra inch or so in length increases swing width, speed, and power. A flexible shaft dramatically improves power. Many golfers go with a stiffer club because it feels sturdier and more robust. However, these clubs provide little bend during the swing. Shafts should bend slightly during the swing to built up energy and power. Generally, it’s a good idea to look for flexible clubs. The more flexible a club is, the more speed and power it will provide. The loft of the head affects the ball’s launch angle during a drive. This launch angle is a pivotal component, as it changes the ball’s distance. With a slow swing speed, golfers should look for clubs that provide a high degree of loft. This helps get the ball higher into the air for more distance. 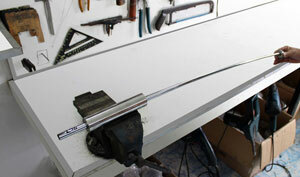 Many manufacturers provide information about the loft of their clubs to make selection easier. Depending on the swing speed, senior golfers can look for lofts up to 15 degrees for improvement. Hitting the ball on the appropriate part of the club head is crucial. A slight miscalculation can send the ball in the wrong direction with inadequate power. Seniors experiencing accuracy issues should look for club heads designed with a larger sweet spot. A larger face and perimeter weighting increases the successful surface area on the club. It’ll be easier to make a successful shot without having to hit the ball perfectly.